The principle of forming the new police will be used in reforming the court system, customs and other agencies, Ukrainian Prime Minister Arseniy Yatseniuk has said. "The court system reform is not visible repairs, but the complete and total change of the whole judicial authorities in the country using the principle of forming the new Ukrainian patrol police. Changes in Security Service, Public Prosecutor's Office, the formation of the new national anti-corruption bureau – the same principle used in forming the new Ukrainian patrol police. 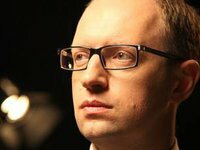 The new customs service, the new tax service, the revoking of the tax police, the creation of the state service of financial investigations [will be formed] using the same principle used in the creation of the new Ukrainian patrol police," Yatseniuk said at an official ceremony of taking oath by the new patrol police in Kharkiv on Saturday. The premier said that he said that the argument of retaining the old staff in court and law-enforcement systems is convincing. "I'm often told that we need to find professionals, and we should not red rid of those specialist who have been working for dozens of years in courts in the whole law-enforcement system. We don't need professional corrupted specialists," he said.